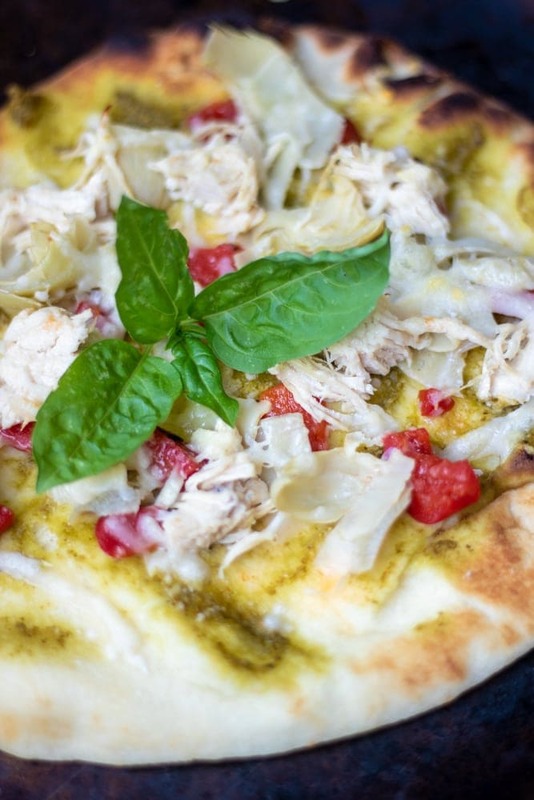 Chicken Pesto Pizza : A quick and flavorful flatbread made with pesto, chicken, artichokes, and peppers and finished with Parmesan Cheese. 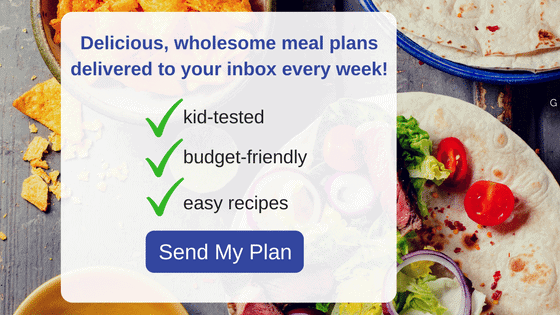 Are you looking for an EASY meal? A meal filled with flavor and can be made in only minutes? Well, that is EXACTLY what I am bringing to you with this Pesto Flatbread Pizza–an easy, flavorful meal that is pulled together in almost no time at all. Soft naan bread is topped with sharp pesto, tender chicken, tangy artichoke hearts, and smoky roasted red peppers. The flatbread pizza is then finished with a combination of Parmesan for a salty finish. 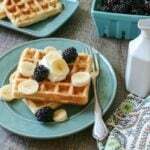 Such a simple recipe with great results! Top flatbread or naan bread with pesto. Top pesto with leftover shredded chicken. Add sliced roasted red peppers to flatbread. Add diced artichoke hearts to flatbread. Feel free to use homemade pizza dough in place of naan bread. You will want to pre-bake the pizza crust for 10 minutes at 425 degrees until browned. Then proceed with topping the pizza dough with the remaining ingredients. If you are looking for a meat-free version, just omit the chicken. If you don’t have leftover chicken, simply saute up 4 ounces chicken breasts. Cube chicken into 1/2 inch pieces and saute over medium-high heat in 2 teaspoons olive oil and season with salt and pepper, for 7-9 minutes or until chicken reaches 165 degrees. An easy flatbread pizza recipe made with pesto, cooked chicken and artichokes and sweet peppers. Top naan bread with pesto. Add artichokes and peppers to flatbread. Season with pepper and crushed red pepper flakes. Place back in the oven for 3-5 minutes, or until cheese is melted. I so love your candid review – I hadn’t heard of Dinner Thyme before, Kriten so thanks for the heads up. 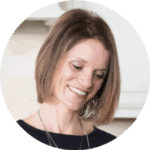 I love to cook and create fun recipes too – but somedays life gets crazy busy and it’s nice to have options – I’ve tried Blue Apron before and loved them – but their portions are so large – I hate wasting so haven’t gone back. Quick dinners are ALWAYS a good thing! Speedy pizza is always going to please my family. This is a brilliant recipe for when you’re short on time but don’t want to just pick up a supermarket prepped one or take-out. Your family sounds a lot like mine Lucy–we love quick pizzas! Love the sound of artichokes on pizza, especially with pesto! Dinner Thyme sounds so handy. The artichokes and pesto were a fabulous combination! YAY for a family win! What a punch of satisfying flavors and ingredients! Perfect for lunch or even dinner. Yes, lunch and dinner are both great options. What a great service! This pizza has allll of our favorites on it. Looks absolutely delicious!